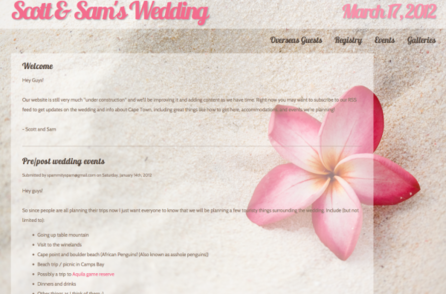 The client: Users of Wedful get to select a theme that their site should use. The clients are various couples who are planning their weddings. I built all Wedful in-house themes. The project: Design drupal themes that worked within the contraints of the Wedful system. The themes had to be robust enough to handle the multiple different ways that people would be using them, and the designs had to try and appeal to a broad spectrum of users.